Police in Michigan inspect discarded materials associated with meth production. The increasing rate of methamphetamine production in Pennsylvania over the past three years prompted a community awareness bulletin from the Pennsylvania State Police on July 21. While incidents in Chester County apparently totaled four, the statistics in the bulletin cited 227 Pennsylvania incidents in 2014 that involved meth labs, dump sites or ingredient seizures by police. The total number of incidents across the country in 2014 was 9,240. It's not just the rooms where the drug is “cooked” that are the problem. Drug-makers are frequently discarding containers, tubes and other components of drug labs along roadways or in remote locations. Motel rooms are increasingly poisoned by toxic chemicals from meth production, and homes purchased by unsuspecting buyers have sometimes been previously contaminated with meth-making chemicals. Items associated with methamphetamine production include plastic bottles, tubing, coffee filters, glass cookware, jars and stripped batteries. Meth is made using common household ingredients which can be volatile. When the ingredients are combined, they give off toxic fumes and could cause chemical burns. Residue from the cooking process saturates everything it comes in contact with, and can remain hazardous for months or years if not properly sterilized. Acute exposure can occur quickly, and produces symptoms that include shortness of breath, cough, chest pain, dizziness, lack of coordination, chemical irritation, and burns to the skin, eyes, nose, or mouth. Acute exposure can even cause death. The police department warning mentions the popular “one-pot” method of making meth. Rather than set up a whole room full of equipment, meth makers can quickly produce the drug while driving, in retail bathrooms, motel rooms or storage units. The container, though, is highly flammable and explosive, but takes only about 40 minutes to complete. It leaves a harmful brown or cloudy residue inside a bottle. The remnants of a one-pot lab can be discarded along roadways, in garbage bins or other areas. Five to seven pounds of chemical waste is generated for every pound of methamphetamine produced. This waste is highly toxic, but it is often buried near the manufacturing site, dumped along roadways or into waterways, poured down drains, or placed in common household garbage. This increases the likelihood that unsuspecting people could come in contact with the material, prompting the warning last week. 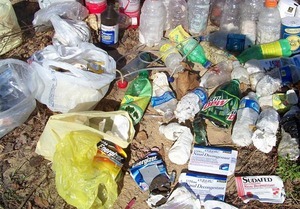 Some common discarded materials include plastic bottles with plastic tubing attached, coffee filters containing a white substance or dark red sludge, glass cookware or frying pans containing a powdery residue, jars containing a clear liquid with a white or red solid on the bottom, and stripped lithium batteries. So far in 2015, five dump sites have been found by road crews, along mostly rural roads. Plastic bottles containing clear liquids, with tubing on the top, were found and still generating dangerous hydrochloric acid. A few one-pot laboratories were also found under pressure and at risk of exploding. In one incident, several partially submerged plastic bags were found in a stream along a rural roadway. When members of the Pennsylvania State Police Clandestine Laboratory Response Team moved the bags, the chemicals reacted with the water and air, causing the bags to ignite. Immediately call 911 if you discover a possible methamphetamine laboratory or hazardous waste from a laboratory. Do not turn on/off any nearby electrical power switches or light switches. Do not eat or drink near methamphetamine lab materials. Do not smoke anywhere near methamphetamine lab materials. Do not open or move containers with chemicals or suspected chemicals. Do not sniff any containers. Do not attempt to dilute a suspected one-pot laboratory with water. The lithium metal can ignite or explode when exposed to water. Always remain upwind and uphill from hazardous substances to avoid contamination. Updated information is posted on the Pennsylvania State Police website, www.psp.pa.gov.